Par keep is a frisbee golf scores keeping app. You can easily keep score of your and your friends frisbee golf rounds and see average, optimal and best scores. You can create as many courses and players as you want. During round it's easy and fast to set fairway scores for each player. After round you can see how everybody did and analyze your play. 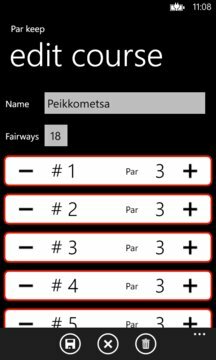 The app keeps statistics of finished rounds. Played rounds and statistics now easily accessible! - backup and restore app data. Use your OneDrive to save your data. - save statistics and results as an image. - somewhat better help with tips.